It has been difficult to get online since I’m currently without my own computer, but I’ve finally managed to get the first comic up. You can check it out clicking on it above or by following the link to it under the pages column on the right. 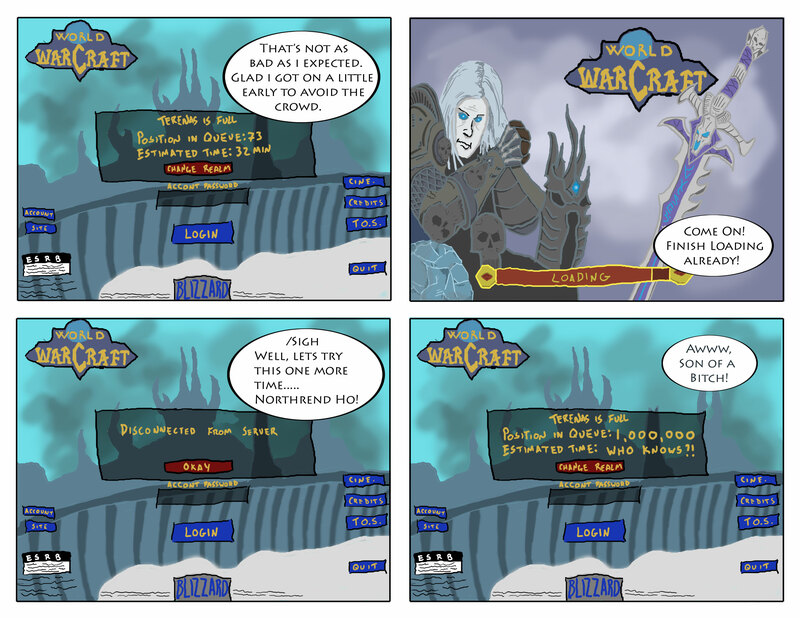 As most of you probably know, the long awaited second expansion, Wrath of the Lich King, to World of Warcraft was released last Thursday at 12:00 am. Since then there have been lots of complaints about server queues, lagginess and disconnects, aka the usual “perks” that come with a MMO expansion. I myself have experienced these problems but not nearly to the degree that others have. Of course I’m going to do a review of the game, however I’m not gonna do one mass review of the expantion as a whole. Rather I’m going to review individual pieces of the game one at a time so that I can put the work and thought into it that it deserves. The first post will be coming in the next day or two but right now let me just say… Blizzard has out done themselves. On another note I’m gonna have a review of another recently released game posted sometime this week. This review however won’t be written by me but instead by a friend and fellow gamer. I hope to be incorporating many more bloggers in the near future to bring you more reviews, opinions and views on a variety of different subjects. My new computer should be arriving in the next week or so which will make it so I can get on a regular schedule of blog and comic posts.